On the weekends, our patio features a great brunch, Bloody Mary bar and we are canine friendly.This weekend, we’ll be celebrating the Cooper River Bridge Run. Join us for an after-run party. Bring your runner number for a free surprise (sorry, I’ve been sworn to secrecy…). We’ll have great food, drinks and music to celebrate the Bridge Run and help kick off the weekend. Come relax with us on the patio for one of the best outdoor dining experiences on the peninsula. 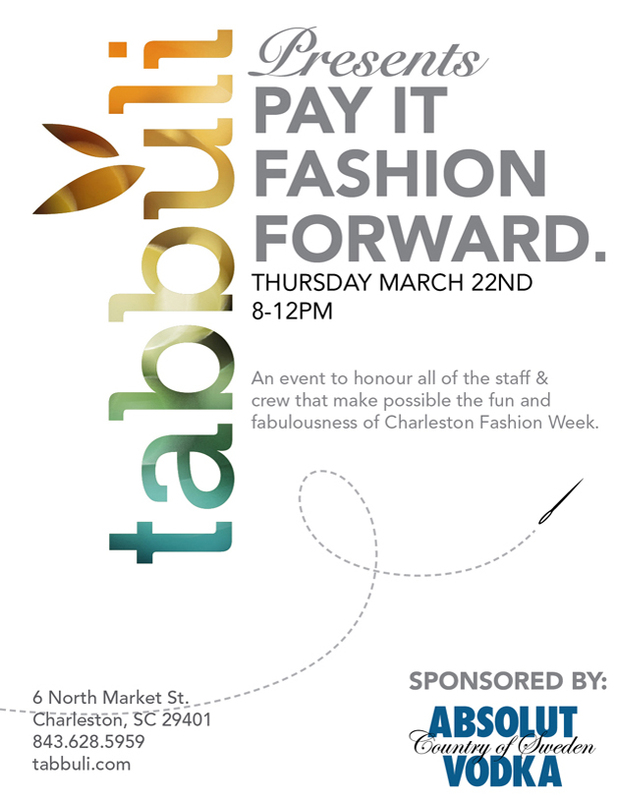 Join us on Thursday, March 22 from 8 p.m. to 12 a.m. for Pay It Fashion Forward at Tabbuli. Come out and help us recognize and celebrate the staff and crew behind the most stylish event of the year, Charleston Fashion Week. Our after party is sponsored by Absolut and will be held on our amazing patio – the best outdoor dining location in downtown Charleston. Absolut will be featuring Grapevine Clear Cosmos. Tabbuli will have fabulous bites, cocktails and lots of pretty people – don’t miss it! 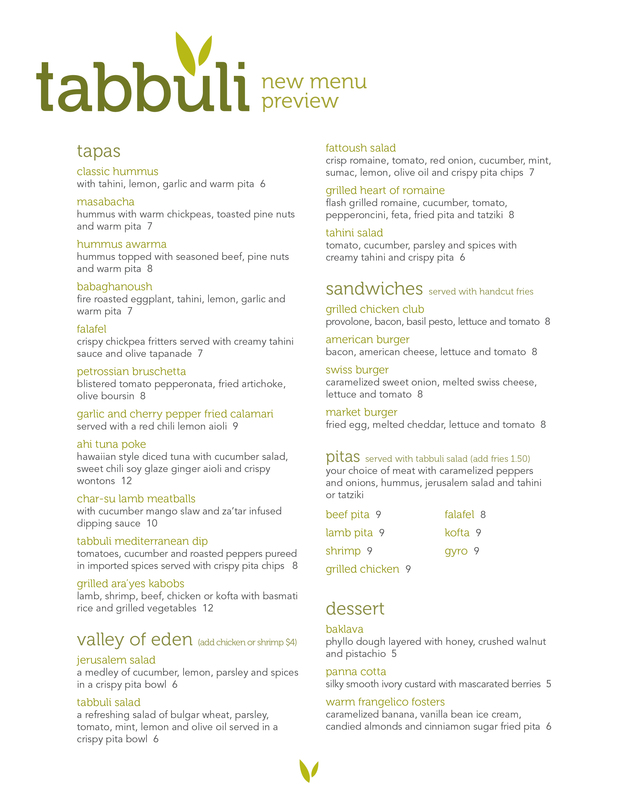 If you are looking for healthy, vegetarian or vegan options, have you taken a look at the new menu at Tabbuli? Chef Scott Vosburgh put a lot of thought into our new menu and has created fresh, appetizing menu items – many of which are suited to vegetarian or vegan diets. Starting with our tapas, our vegetarian/vegan options are hummus, masabacha, babaghanoush, falafel, petrossian bruschetta, and Tabbuli’s Mediterranean dip. All of our salads – Jerusalem salad, Tabbuli, fattoush, grilled heart of romaine and tahini salad are all vegetarian friendly, as is our falafel pita. Love dessert? Enjoy our baklava or our warm frangelico fosters (without the ice cream). Have other special dietary concerns? We can help. Talk to your server or call us ahead of time to find out what modifications can be made to accommodate your diet. 843-628-5959. Tonight at Tabbuli join Aaron of Flair Bartending Charleston and Abram Boise of MTV fame. If you’re looking for dinner and a show, we’ve got you covered. Our beautiful patio dining will be in full swing this evening and we have patio heaters to ward off the chill this evening. Our new menu is available and we’ve got some sneak peek photos of some of our new menu items. Check them out here first!